Note: ThreatSTOP recommends the ThreatSTOP Centralized Manager (TSCM) version of PANOS over the single-device script . The TSCM version offers fewer reporting issues, with easier device setup. Instructions for the TSCM version are available here. Palo Alto Networks devices are supported in a different fashion to all other devices we support. Rather than using our patented DNS mechanism to update policies and target lists we we use the built in Palo Alto feature called Dynamic Block List. This page only describes creating simple ThreatSTOP policies one for inbound and one for outbound traffic, but more complex uses are possible. ThreatSTOP is compatible with most versions of PAN-OS. You must have PAN-OS 6.1 or greater running on the Palo Alto Networks device. 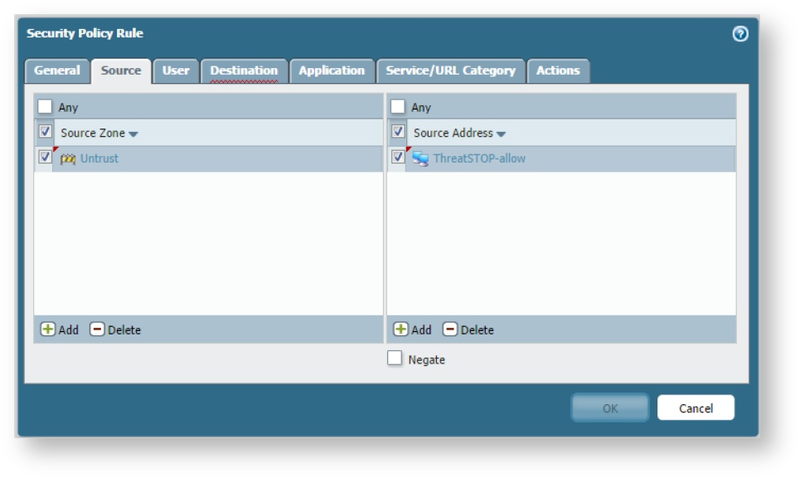 It is recommended that you save the configuration prior to applying the ThreatSTOP changes. 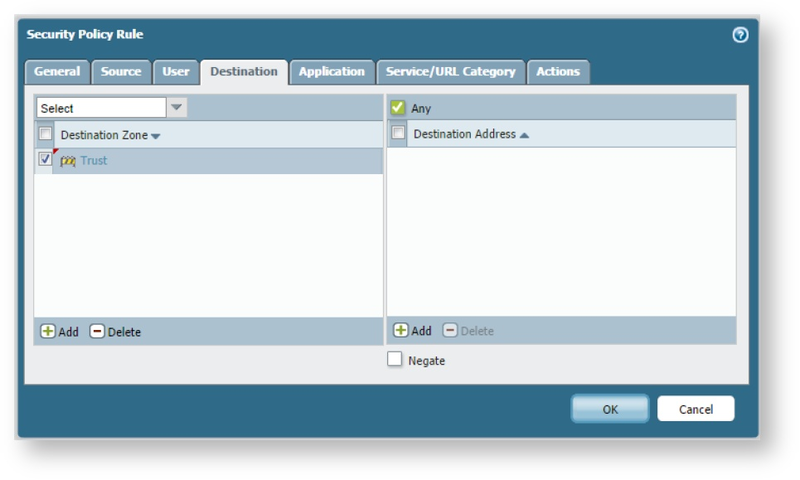 While the portal setup is still largely as described in Introduction – Adding a Device. The single-device setup for PANOS has one extra field added to it Lines in Block. The methodology for PANOS logging setup allows the users to submit up to eight (8) log blocks as established in Setup – Device steps 3-4. The widest range of PANOS devices support 36,000 addresses (split into chunks of 4,500 apiece). However, some devices are able to support more than this 36,000 address limit, while others are not able to support this amount. Due to this variation we’ve allowed an adjustment to the number of address objects per dynamic block list. To figure out the number of lines to allow in each dynamic block list for your device take the maximum number of addresses supported by your device, divided by 8, and subtract about 300 lines per block (to give a little buffer room for internal addressing). Enter the result in Lines in Block and click Next. Lines in Block: The maximum number of addresses supported by your device (m), minus 300 lines of buffer, and divided by 8. Connect to the PAN device using a web browser, login and select Objects and then Dynamic Block Lists and then add a new list. Click on the Test Source URL button and confirm that the device is able to download the blocklists without errors. If successful set the Repeat pull down to Hourly and set the time to, 08, then press OK.
Now repeat the process to create additional block lists replacing the 001 in the URL with 002 to 008 and similarly replacing the ThreatSTOP-block1 with ThreatSTOP-block2 to ThreatSTOP-block8 in the name. Having done that you should create the ThreatSTOP allow list in the same way. 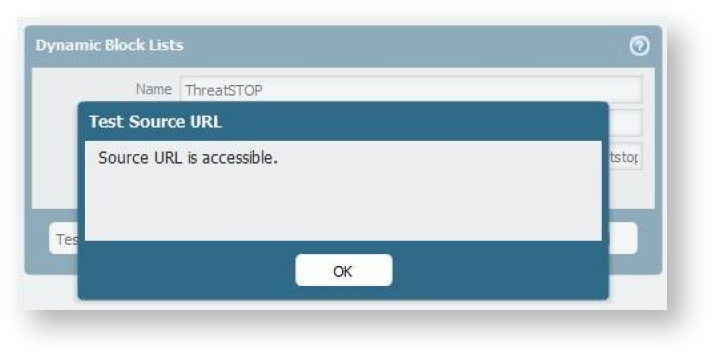 You should call the list ThreatSTOP-allow and add the source URL as follows: https://www.threatstop.com/lists/..threatstop.local . Again test to ensure success and if successful set the repeat to Hourly, the time to 08, and click OK. When this is done you should have objects similar to those in the image to the right. Now go to Policies, and add an inbound policy that permits traffic originating with the ThreatSTOP-allow list (source) in the untrust zone to anything in the trust zone. Then below this add a second inbound policy that denies traffic originating with the eight ThreatSTOP-block objects (source) in the untrust zone to anything in the trust zone. Now repeat these steps for outbound traffic (i.e. 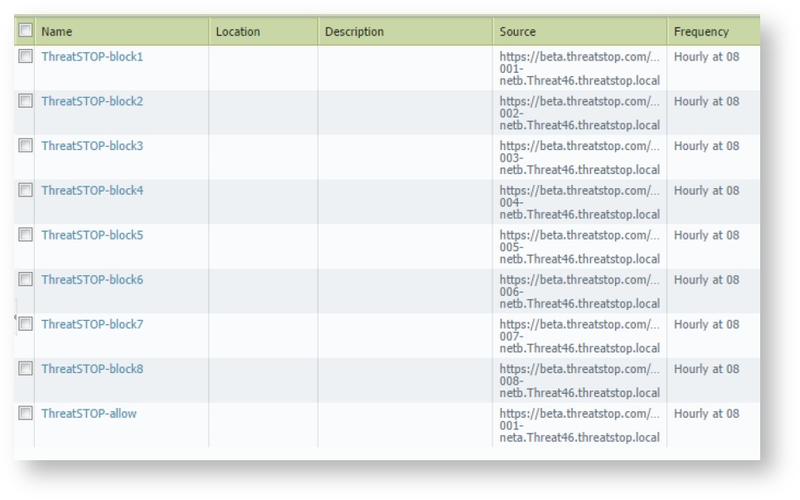 destinations are the ThreatSTOP lists in the untrust zone and the source is all traffic from the trust zone). When this is done you should have policies similar to those in the image below. 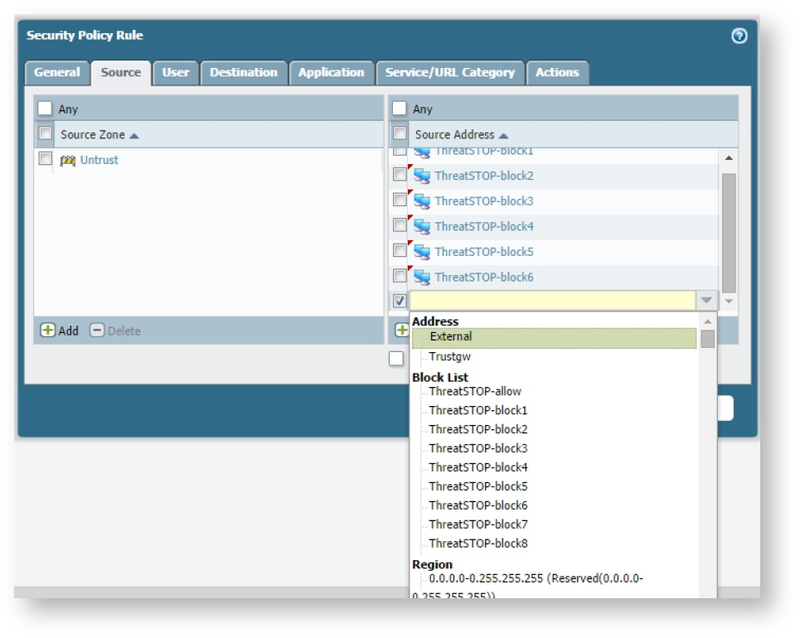 Once these policies have been committed, your firewall is being protected with ThreatSTOP. 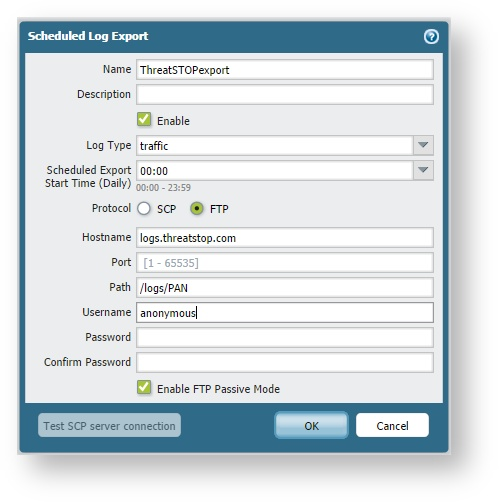 Warning: While this method to upload logs does work, the “Scheduled Log Export” will render results for the previous 24-hours, and older recorded logs, in the ThreatSTOP reporting system. 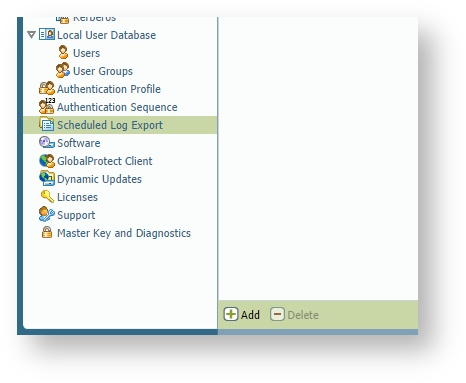 Connect to the PAN device using a web browser, login and select Device and then “Scheduled Log Export” and then add a new entry. No password is required and FTP Passive Mode should generally be enabled. The firewall uploads this data once per day. Caution: Removing the ThreatSTOP objects will not remove references to ThreatSTOP Logging and Reporting if it has been referenced in other objects. If implemented these will need to be removed by hand. 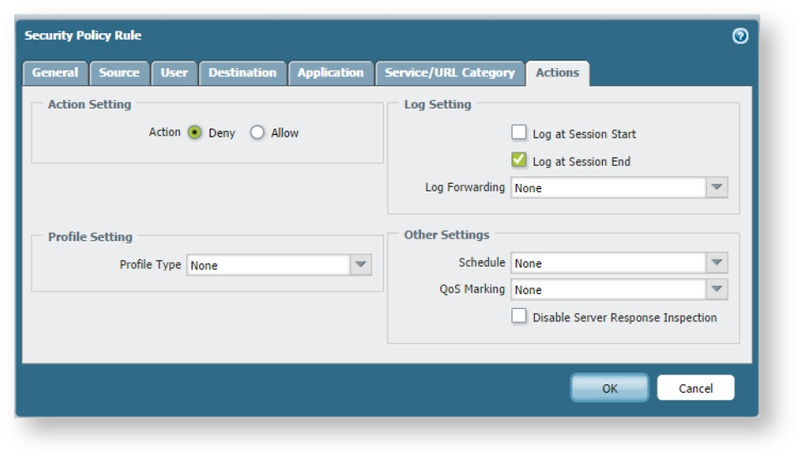 In addition, the log forwarding profile and syslog server profiles will also need to be manually deleted.